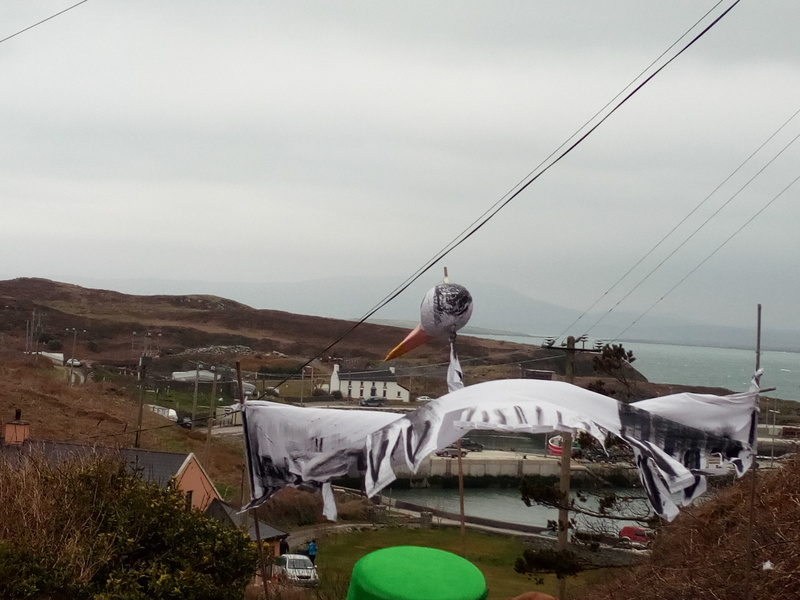 An Pharáidín ghleoite ar Oileán Chléire! Bhí sár lá againn Lá 'le Pádraig, ba é an dara huair dúinn páráid a bheith againn ar Chléire. Bhí fás agus forbairt uirthi i mbliana! Ghlac slua breá páirt inti idir óg agus aosta, idir oileánaigh agus cuairteoirí. Tugadh suntas de ghnéithe de chultúr agus traidisiún an oileáin, feirmeoireacht, farraige, stair, ceol agus rince. Bhí Gallán Chléire le feiceáil, Éan mór mílteach agus bhí a chairt féin maisithe suas go gleoite ag an mBád Farantóireachta. Bhí ard-sprid san aer nuair a shiúil an slua ón gCuan Inbhear go dtí Trá Chiaráin. Bhí bratacha ar foluain, páistí gléasta suas agus mascanna áille a orthu a rinne siad féin, laochra ceilteacha le dath gorm ar a n-aghaidheanna, líon an t-aer le ceol ó na feadóga stáin agus na bodhráin. I measc na ndaoine bhí gabhar gléasta suas mar Lochlannach,caora beag agus madra nó dhó le héadaí glasa orthu don lá. I gceannas na paráide bhí ár gCeann Feadhna, Danny Stewart ag stiúradh imeachtaí. Bhí stad nó dhó ar an mbealach chuig an gcuan agus rinne na daoine óga, faoi stiúir Stella Perry rince álainn agus bhaineamar ar fad ard taitneamh as. Nuair a bhí ceann scríbe bainte agam againn, chanamar Amhrán na bhFiann agus seo linn chun an cluiche rugbaí a fheiceáil, sárchluiche a bhí ann agus d'éirigh go seoigh le Foireann na hÉireann. Cuireadh bia blasta ar fáil ina dhiaidh(buíochas le CARA) agus bhí séisiúin ceoil den scoth sa Chub. Iontas na n-iontas níor thit oiread agus braon baistí anuas orainn! Táimid ag súil go mór le paráid na bliana seo chugainn! The Littlest and Loveliest Island Parade! 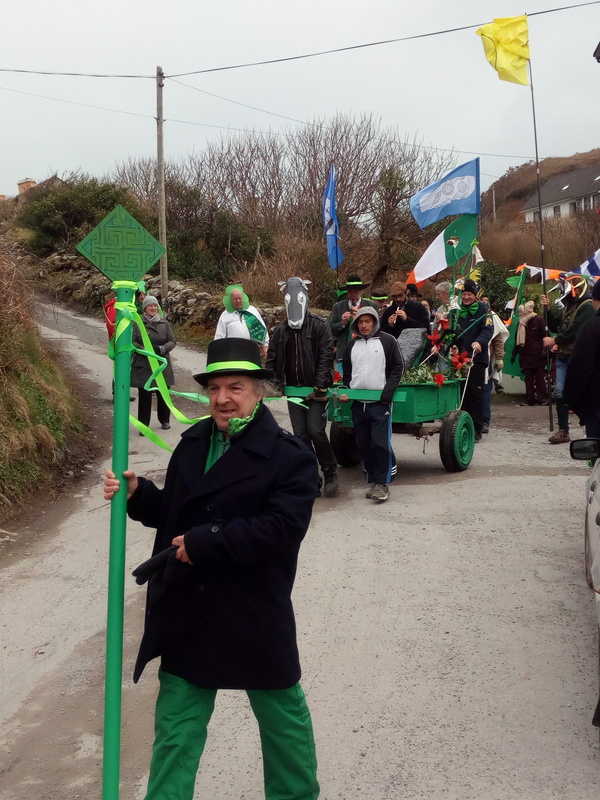 The second St. Patrick's Day Parade on Cape Clear was probably the littlest and loveliest Island parade anywhere along the Haven Coast. This year saw some new floats and the parade featured culture and island life, farming was well represented with one or two goats, one of which was beautifully turned out in a Viking Hat, there was a liitle Soay sheep and one or two dogs dressed in green for the occasion.The floats featured The Cape Clear Stone, and the Cailin Óir Ferry was also represented. The area is renowned for birdwatching and a giant animated heron made a great impression. Flags of the O'Driscoll Clan, Ireland, Munster and Celtic Nations abounded. People were dressed up in colourful costumes and local young people wore wonderful masks they made. There were punks and celtic warriors with blue woade on their faces. The air filled with the sound of tin whistles and bodhráns being payed with gusto. 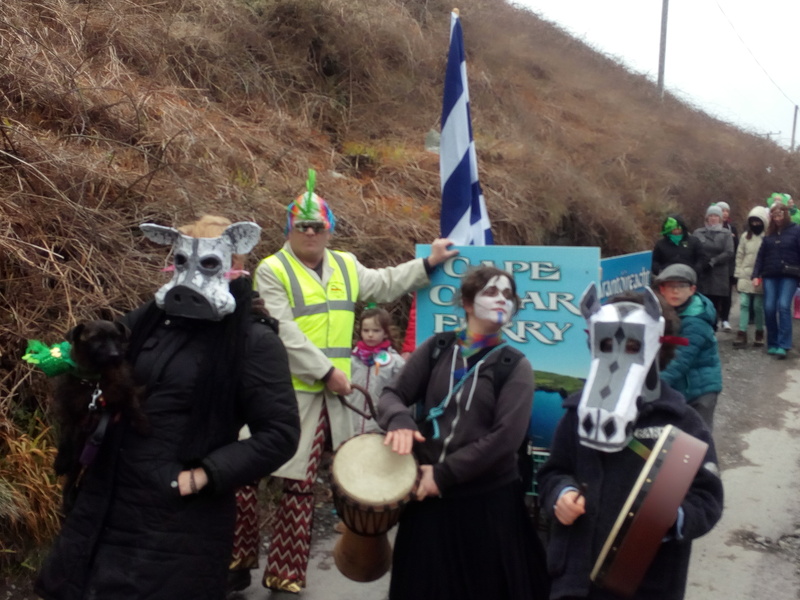 The parade moved along from South to North Harbour with locals and visitors all taking part. The atmosphere was genial and joyous. One or two stops were made along the way where the young people performed some beautiful dances to the music of local musicians. At the head of the parade, our Grand Marshal, Danny Stewart led with great gravitas. When we reached North Harbour we sang Amhrán na bhFiann( National Anthem) and then moved to the Club to watch what turned out to be one of best and most historic rugby matches ever, Ireland sealing a well deserved win in Twickenham, followed by some great food (organised by CARA) and a super session! What a great day it was! We are looking forward to next year's parade already. A huge thank you to those who made it possible!